Nevada sports books could accept bets from out-of-state customers once a federal ban is lifted, if regulators position the state now to cash in. The Nevada Gaming Control Board is weighing changes that would let operators accept wagers from other states or countries with legal sports betting, as long as it is permitted under federal law. That gambling is banned under the Interstate Wire Act of 1961, Chairwoman Becky Harris told Bloomberg Tax. But regulators could revise the state’s rules now as an “efficiency measure” to be ready to enter that market, Harris said. Nevada lost its monopoly on legal sports betting when the U.S. Supreme Court in May struck down the Professional and Amateur Sports Protection Act, opening the industry to other states. Regulators and operators are grappling for the first time with how the industry functions across state lines. Delaware, New Jersey, Mississippi, and West Virginia have legalized sports betting and are taking bets. New York, Pennsylvania, and Rhode Island have legalized sports betting but haven’t started taking bets. Interstate sports betting would be a boon for operators that want to expand into other places, attorney Kate Lowenhar-Fisher, gaming and hospitality practice group chair at Dickinson Wright PLLCin Las Vegas, told Bloomberg Tax. It also raises a host of questions about how the gambling would work and which state would get the tax revenue. “Nevada would probably be extremely well-positioned to be a hub,” she said. At stake for gaming companies is the potential for access to more customers and more efficient operations, Glenn Light, a partner with Lewis Roca Rothgerber Christie LLP in Las Vegas, told Bloomberg Tax. Right now, each state acts as its own market. With interstate betting, operators wouldn’t have to have servers in each state in which they accept sports wagers, said Chris Krafcik, managing director of political and regulatory markets at Eilers & Krejcik Gaming, LLC. The California research firm focuses on the gaming industry. Still, the industry “will find ways to thrive even within the constraints of the Wire Act,” he said. States are starting “to lay the legal groundwork” for sports wagers between states, Krafcik told Bloomberg Tax in an email. Nevada could join a few states with newer laws and regulations that effectively allow interstate sports betting if changes to the Wire Act allow it, Krafcik said. Some regulators in new sports betting markets told Bloomberg Tax they’re more concerned with launching the industry within the state. In Nevada, regulators are getting feedback on the interstate betting rules and other changes to sports book operations. The Nevada Gaming Commission would independently consider approving new policies. The federal ban means there are still a lot of unknowns, including how taxation would work if the operator and bettor are in different places, Harris said. Casinos would see more money than states, which only get a fraction of any wins, said Richard Auxier, a research associate in the Urban-Brookings Tax Policy Center. But sports betting in general is a small money-maker compared to other types of gambling. 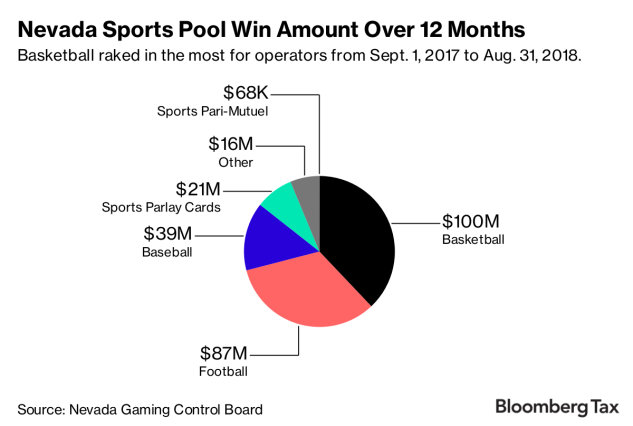 Nevada sports pool wins were roughly 1.4 percent of the state’s total gaming revenue in August, according to the most recent data from the Nevada Gaming Control Board. Nevada taxes sports book earnings at a maximum of 6.75 percent. “It’s really not that much,” Auxier told Bloomberg Tax. It could be a while before Congress changes the federal Wire Act to allow interstate betting, Karl Rutledge, a partner with Lewis Roca Rothgerber Christie LLP in Las Vegas, told Bloomberg Tax. Bets can’t cross state lines, though some information sharing is allowed. Federal lawmakers are considering a variety of issues surrounding legalized sports betting regulation. The House Subcommittee on Crime, Terrorism, Homeland Security, and Investigations held its first hearing on the topic since the Supreme Court decision last month. The committee is looking at what role Congress should play as states develop their policies, including possible Wire Act changes, Chris Krepich, press secretary for committee Chairman Jim Sensenbrenner (R-Wis.), told Bloomberg Tax in an email. Sensenbrenner “believes that this issue should be addressed quickly,” he said. Krafcik said his firm thinks Wire Act lobbying will increase in the coming years but will likely become a “lightning rod” among sports betting interests on Capitol Hill. Professional sports leagues will surely want to make operators buy official league data as part of the changes, which the gambling industry would oppose, he said. Major Nevada gaming companies including MGM Resorts International, Caesars Entertainment Corp., Wynn Resorts Ltd., and William Hill PLC didn’t respond to requests for comment. Las Vegas Sands Corp. declined to comment in an email to Bloomberg Tax. A spokesman for Boyd Gaming Corp. deferred comment to the Nevada Resort Association, which didn’t respond to requests for comment. Nevada has a history of passing statutes in anticipation of federal changes, such as an internet gaming law passed in the early 2000s before the Department of Justice said the gambling was allowed, Lowenhar-Fisher said. The same concept applies to interstate sports betting. Gaming states are finding other ways to work together as legal sports betting spreads across the country. Regulators this month announced a new interstate group of state and federal officials, tribal leaders, and industry representatives that will look at regulatory and operational issues as well as information sharing.